As an animal behaviorist and television host, people often contact me about training dogs and exotic animals for television and movies. When appropriate, Callie, my very white yellow lab is cast in these exciting roles. While Callie doesn’t make a full-time living doing commercials and television (she has to reserve time for naps and playing fetch), but she does work about a half dozen times a year. Along with discussing some of Callie’s recent work in television and commercials, I’ll also give you some tips about how you can prepare your dog to appear in commercials, television, and movies! Callie started her year with a photo shoot for Purina. 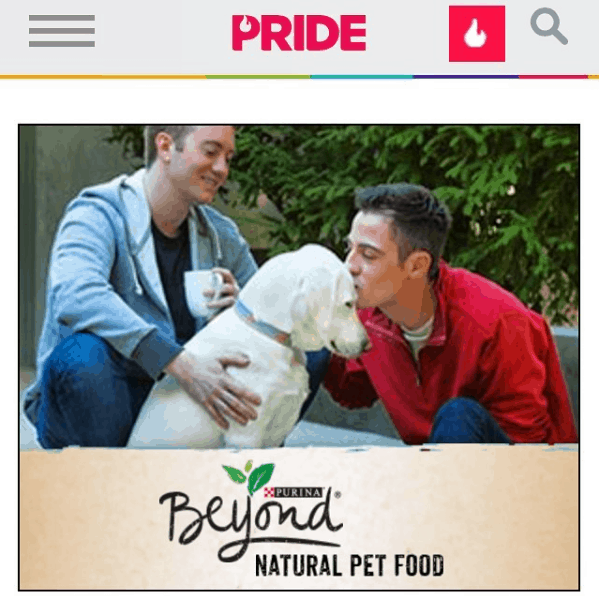 Purina cast me, my boyfriend Chase, and our dog Callie in their LGBT campaign. Purina was looking for dogs with basic obedience training and the ability to work in proximity with other animals. Also on set, was a dear friend of mine, Joel Silverman. Joel is also a former marine mammal trainer and works extensively with animals for commercials, television, and movies. If you’ve ever seen a dog in a commercial, there is a good chance that Joel was responsible for the training. Callie was asked to pose with Chase and I in the ‘sitting’ and ‘down’ positions. Overall, it was very easy, and dogs with basic obedience training would have done very well on the shoot. 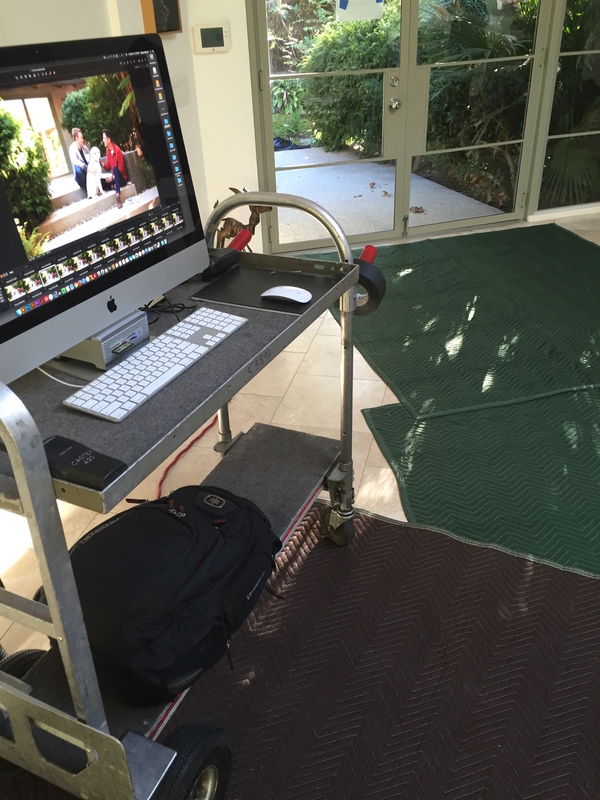 Because my dog is professionally trained, we were able to get the shots we needed quickly. Production crews love that! On a set, time is money, and the longer we have to wait for an animal to cooperate, the more money the production team is spending. Additionally, you may only have a few moments to capture the right lighting, and a dog who isn’t practiced behaving on-set could cost the shot. Callie is famous in Japan! Well, sort of. Well, not really. However, she was in a Toyota commercial that shot in Los Angeles but aired nationally in Japan. They needed a dog to take a variety of verbal signals from a trainer off-camera (such as: sit, stay, down, walk to the left, walk to the right, stop, etc.) and also catch a ball in the air. 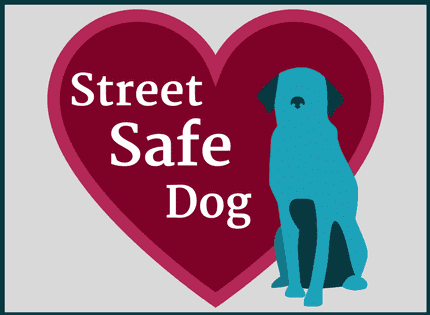 While most dogs can sit and stay when asked, it’s harder to find dogs who can complete those behaviors on a television commercial set with lights, dozens of people, sound booms, and a director on a megaphone. It’s even harder when you can’t be in the shot with the dog. Callie was such a pro. I truly believe that she knows when the pressure is on, because every time (knock on wood) we have been on set she turns into a “one-take wonder” and nails every shot the very first time. 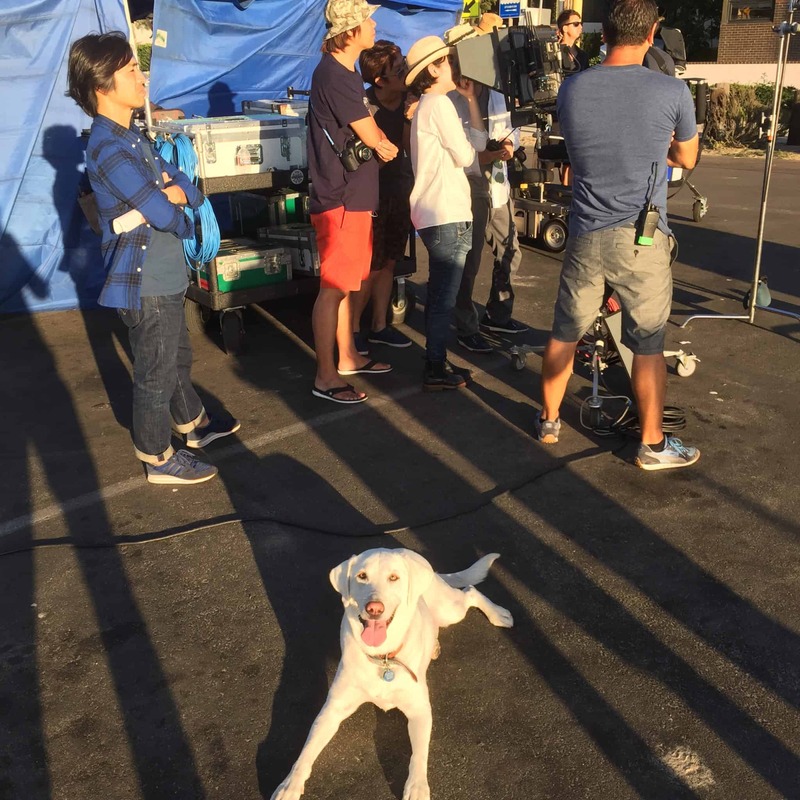 As we began shooting the commercial, the team from Japan, who spoke no English, clapped and cheered for Callie as if she were some sort of celebrity! You could tell they were pleased, even if they didn’t say they were in English. 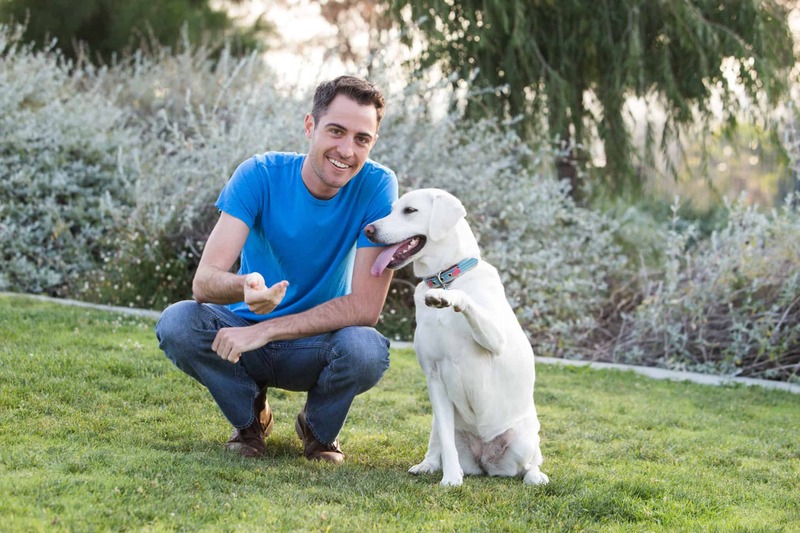 I was contacted by the production company in charge of creating a three-part series on canine intelligence titled “Dognition.” Dognition is an online training course used to better understand your dog and develop a stronger, more in-sync relationship. The production company used dozens of dogs for the shoot, and I was honored to be involved to help educate people that there is more to their dog than they understand. Dogs are incredibly deep, intelligent beings who give us tons of signs every day to tell us what they want, what they like, and what they don’t like. Understanding this allows us to literally talk to our dogs and have them talk back. This open communication allows for a better relationship with your dog. The production company originally told me that they only needed my dog to sit, stay, and maybe come when called. I told them, “no problem!” Once on set, however, it was an entirely different story. They now needed my dog to sit on a chair by herself, come to me when I entered the house, go grab her rope from a bucket of other exciting toys, bring it to me, and then exit the house. Luckily, Callie does have the basics of object discrimination down, so this was totally doable. You can see video of that behavior chain below. What they needed next was for Callie to walk into a room, stop, look at a table, and then slowly walk out of the room. She had to do this with nobody else in the shot with her, and I couldn’t use any verbal commands. So, we practiced one time using verbal commands. Then practiced one time using visual commands with me in the shot and then filmed it with me out of the shot and only using hand commands. She nailed it. She is truly an amazing set dog! I know there are better trained dogs for television, commercials, and film, but Callie is something special. The production team seemed very pleased with Callie. They also said that out of all the dozens of dogs they shot, Callie was the best. She got everything in one take, and we worked for 3 hours with no breaks. I was mentally exhausted, so I can only imagine how Callie felt. You can catch Callie (and glimpses of me) on NatGeo Wild Dognition. I have produced shows for Discovery and now have a TV Pilot Comedy called Kennel Club. LOGLINE: When an Alabama country soldier returning from Afghanistan moves to LA to care for his ailing mother, he cannot relate to the California city girls until he meets a shrewd entrepreneur who operates a high-end kennel that secretly rents the dogs out to men who walk them to find women. HUNTER WADE, a two-tour marine from Alabama, moves to LA to take care of his ailing mother and opens a barber shop. He sees a woman walking a dog across the street encounter a man walking his dog. The dogs sniff each other prompting a conversation, then the two walk off together in the same direction. This gives Hunter the idea that maybe he could find a girl if he only had a dog. ROCHELLE, the barber cutting from the second chair and an LA lady who just wants to have fun, points out to Hunter that the idea won’t work because Hunter doesn’t really like dogs. So, instead, Rochelle sends Hunter to style hair in a salon owned by her lover, the complex and compelling ANGELA, who leaves Hunter’s phone on the counter so Rochelle can hear the conversations and text Hunter what he should say. The plan fails miserably when the first customer discovers Hunter learned to cut hair in the marines, turns her head and loses a chunk of her hair to his scissors. Hunter goes to the animal shelter and gets a Pit Bull, believing women will think he is as masculine as the dog. Hunter receives permission from the manager of the animal shelter to take the dog on a trial run to his house to see if the dog acclimates. Instead, Hunter goes directly to the dog park, unprepared. The Pit Bull fights other males, misbehaves with the females and turns off all women walking their dogs. After cleaning himself up, Hunter returns the Pit Bull to the shelter and now chooses a Poodle, believing the women will think the dog is cute. He tries again at the dog park, but is approached by men and gives up on the idea of finding his mate with a dog. A customer introduces Hunter to a lady who had a problem with an airline not allowing her to take her dog on the plane. Hunter agrees to keep the dog for a week, and immediately takes the friendly dog to the park, discovers the dog can catch a frisbee and then meets a beautiful girl, but she is vegan and the relationship doesn’t work. Instead, Hunter falls in love with the dog and both he and his bed-ridden mother are brokenhearted when they have to give it back. Angela and Rochelle feel bad about what happened at the salon and invite Hunter to dinner at their house. Afterwards, they offer themselves as dessert, claiming the only way they can teach Hunter about LA women is hands on. Hunter declines, telling them he is looking for a serious relationship. Angela secretly tells him she is interested. Hunter then discovers that BENNY, a shrewd entrepreneur that hangs out at the barber shop, has watched Hunter’s misadventures and has come up with his own plan: He is a such a schemer and dreamer who has barked up the wrong tree so many times, he finally turns to the dogs. He fixes up his property to create the perfect environment for canines to stay while their owners are away. He advertises his service, receives dogs, then secretly rents them out to other men like Hunter who take the dogs for walks around areas of LA to meet girls. Benny’s deal includes seminars on what to say to pick up the ladies. Hunter joins the discreet club and learns the secret handshake and club cheer. 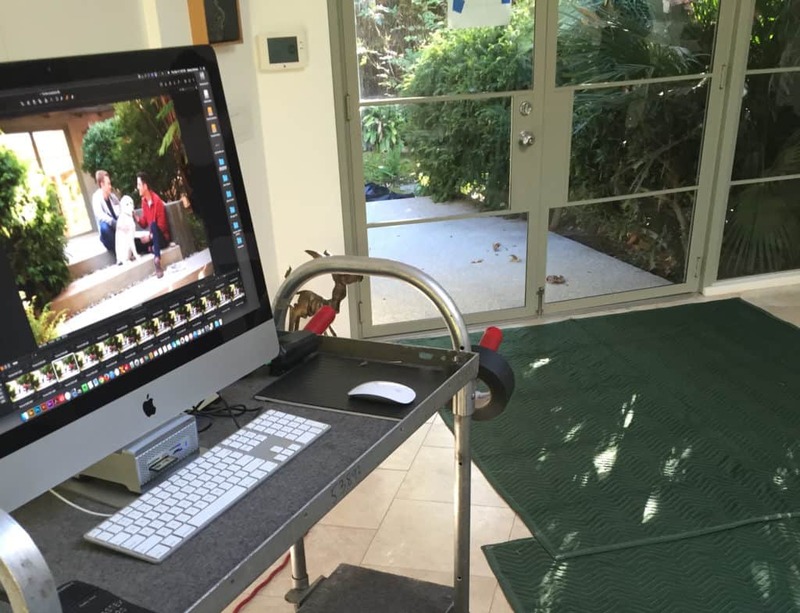 Kennel Club offers many comedic opportunities for LA actors to join the show for a weekly episode which will be self-contained and resolve and reset every week. Different male members join Kennel Club and rent dogs to meet different female dog owners.as Coach Benny instructs the suitors in the fine art of female engagement. Think Cheers meets Hitch at the dog park. Well-known actors can drop off their actual pets at the kennel in cameo appearances. Alongside the new weekly romantic adventure is the continuing relationship of Hunter, a 21st century version of Chaucer’s “strong and true yet gentle knight”, with his fellow barber shop cutter Rochelle and her lover Angela. The love triangle complications weave throughout the seasons, further complicated by Benny and his girlfriend CHARLENE, who have their own ideas about what Hunter should do with these two LA ladies. •	Hunter attends Benny’s seminar entitled How To Pick Up The Hotties, discovers Benny has all his great ideas while sitting on the toilet and takes various laxatives for enlightenment. One of his ideas is to enlist Uber drivers to spot ladies walking their dogs and then contact the club so members can hurry out to meet the babes. Charlene makes an excel spreadsheet and catalogs the dog walking habits of LA ladies for use in renting out the dogs. •	Charlene keeps detailed accounts of members biorhythms, astrological signs and interactions of dog breeds. Benny uses this information to create the perfect app to find a soul mate, but the plan backfires when club members encounter the opposite results of what is expected. •	Hunter succumbs to Angela’s advances, but then Rochelle flirts with Hunter and the love triangle blossoms. Hunter is almost caught with both women at once, but survives with the help of a quick dog delivery so it looks like Hunter is on the prowl. •	Benny thrives as the secret club becomes a franchise, “heading to a city near you”. Charlene runs the club in LA, becoming a madam of sorts, offering the wonderful pets of entertainment royalty out quietly to the club members, who use them for their own advantage. Exciting events keep the audience on edge as owners nearly discover what their pets are being used for. •	ASHLEIGH, a pet store manager, notices that many men are coming in to buy things for dogs even though they know very little about them. She investigates and uncovers the scheme, threatens to expose it but Benny allows her to become the first female member of the club in exchange for her silence. She remembers Hunter from his first visit to the pet store and shows interest in him. First Season character arcs include Hunter’s change from the country boy looking for a wife to city stud. Angela and Rochelle are a tight, fun-loving couple in the beginning, but, by the end of the first season, their rivalry for Hunter’s affections intensifies and the tension between them grows to a blow-out. Benny learns how much Charlene really means to him. As a series, Kennel Club is timely, interesting because of the unusual and lovable dogs, and inciteful because of the interaction between weekly newcomers and the common-thread cast, who have their own continuing conflicts of personalities, life styles and events that combine to keep the audience on edge and entertained. Please advise if you would be interested in reading the script.